When you’re pregnant the last thing you want to hear is that your baby is ill, but to learn that your baby is going to die no matter what you do to try and save it is immeasurably heartbreaking. Krysta Davis was excited about her baby to come but when she found out that her baby had something known as anencephaly she was in shock. For those who do not know anencephaly is a severe birth defect that in most cases only allows babies to live a few days out of the womb at most. 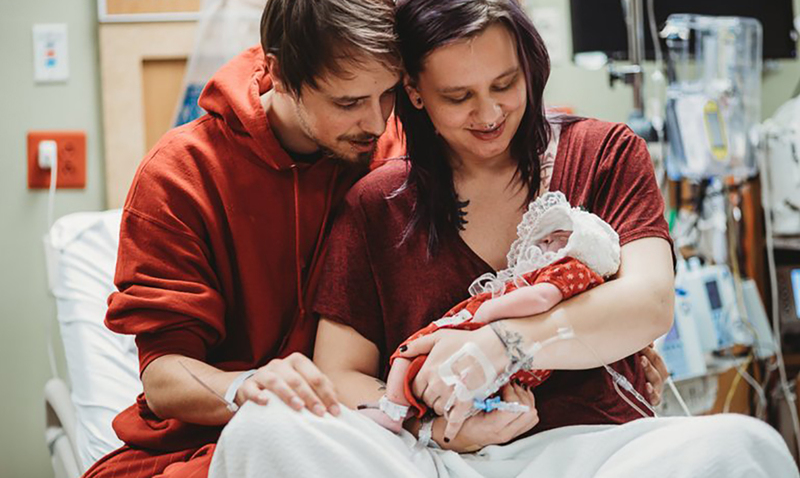 The couple were given several choices as to how they should move forward but the couple (Krysta and her partner Derek Lovett) chose to continue on with the pregnancy to full term so that they could spend some time with their child and then donate the organs given his/her passing. Krysta went on to give birth to a beautiful little girl with whom the couple spent several days with soaking up every moment they could. Krysta said that the idea of donating their daughter’s organs is what sealed the deal for them pushing through to full term. She felt like she should at least give mothers who would be able to potentially bring their babies home the chance to do-so. While a hard thing to go through this couple managed to do what they felt best and in the end saved lives through allowing theirs a chance. While this precious baby was born with her brain exposed, to her parents she was perfect no matter what. Efforts like this are what keep humanity thriving. This amazing little girl while only here for a few days was able to change lives and that is something that will last forever. This marvelous little girl’s name was Rylei her life held more meaning than most could dream of. Her parents made one of the hardest decisions they could have ever had to make. Because of Rylei’s heart valves being donated, two other babies got to continue living and that in itself is a miracle. To see some of the best moments from this precious little girl’s life check out the video below. I guarantee you will be in tears by the time it is over with. So tiny and fragile but still able to do so much good in this world.